PersonaliTees have been making custom apparel for over 30 years, inclusive of personalised graduation t shirts and personalised hoodies for kids, older students and teachers! As a family-run business, we love sending the yearly graduates off in style in their carefully designed personalised school leavers T shirts. Our personalised t shirts in Australia aren’t limited to graduates either! We can create custom t shirts for all kinds of school events, from sports teams to school excursions, we’re dedicated custom school uniform suppliers. 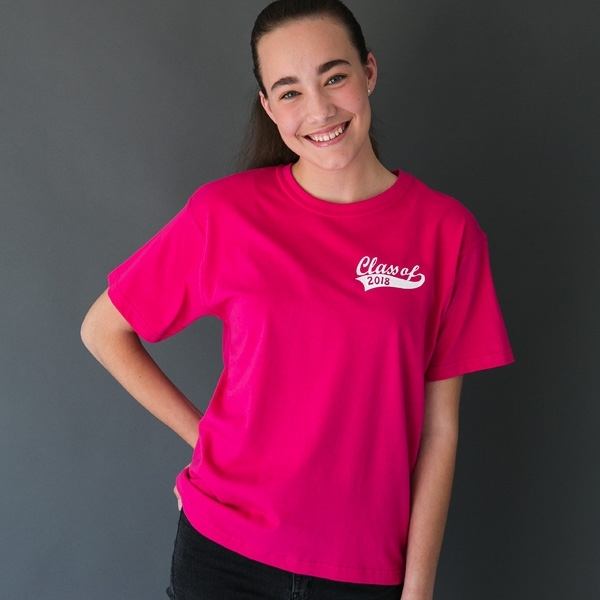 So, whether you choose one of our designs or design your own custom t shirts for schools or graduation, you’re guaranteed premium quality personalised t shirts in Australia. The school uniforms and custom graduation t shirts available online can be tailored to your specific requirements, whether you’re purchasing for a small group of friends or for a whole class of school leavers, our range of custom t shirts for graduation are the perfect way to keep the memories alive for years to come. Now comes the fun part! Our Tee is 100% cotton, 100% comfortable, making it the perfect blank canvas for you to put your own personal spin on to. Simply choose between our huge range of colours and add the designs to your personalised school leavers t shirts. Design wise, you’re able to upload your own artwork to the website when you’re creating your custom uniform and graduation t shirts online, and we also have a range of artwork to choose from too. Express your PersonaliTee through our custom t shirts for graduation and schools and make the most out of your graduation and school sports teams by buying enough for the whole class. Prices vary depending on the quantity of products your purchases, and our team are able to tailor your orders to your specific requirements upon request. Design and create your very own personalised T shirts and apparel at PersonaliTees. Simply fill out our simple and easy online form for more information, or email us on info@personalitees.com.au with any queries regarding orders or potential orders.